What’s not to love about a cascading wall of chocolate? A chocolate fountain livens up any party instantly, but can you use just any chocolate? How do you make chocolate the right consistency for a smooth flow? You need the right kind of chocolate for your fountain. Sure you can crush up some supermarket chocolate and add oil, but do you really want that? Think of your children and your guests and get some well-made chocolate. If you aren’t sure where to start, we’ve put together a list of our three favorites. Plus, we’ve answered some questions you might have about how to choose the right chocolate, how to prepare, and what to do after. Let’s take a look. What Kind Of Chocolate Do I Need? How Do I Prepare The Chocolate? How Do I Store The Leftovers? 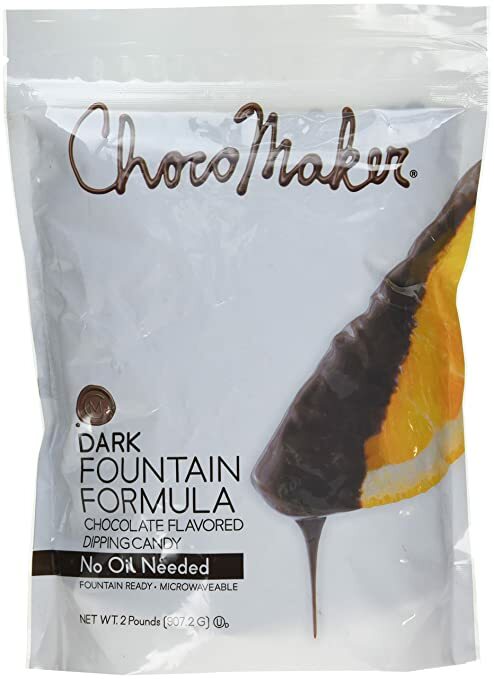 ChocoMaker’s dipping chocolate is a smooth and consistent bulk chocolate that’s specially prepared to add into a chocolate fountain without adding any oils. It comes in a two-pound bag, which should be plenty for a chocolate fountain serving around 12 people or fewer. The chocolate is in thin wafer-style pieces instead of large chunks, so it heats evenly and quickly. It even heats well in the microwave without scorching (no big pieces that refuse to melt even as the rest bubbles). The consistency is very smooth, and it flows well through the fountain. It’s thick enough to stick to any food bites without creating too many drips or run-offs. It comes in three different flavors (milk, dark, and white vanilla), but the most common is the milk chocolate. It does have the slightest chalky taste, especially as it runs through the chocolate fountain for an extended period, but it’s only noticeable if you eat the chocolate straight. With something a little sweet to dip, you don’t get that flavor at all. We recommend pouring the leftovers onto a cookie sheet with wax paper and putting it into the fridge, so you can break the pieces apart to store. There isn’t too much discoloration after it’s cold. It is made in a facility that also processes peanuts, so be careful of allergies. 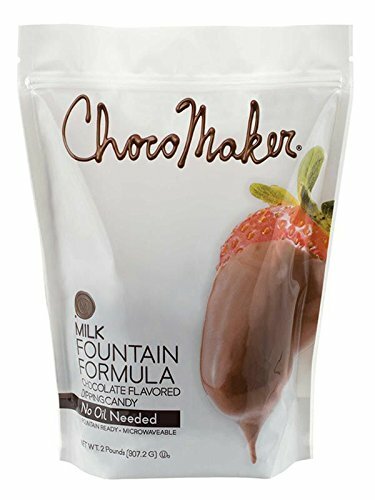 You don’t have to use this chocolate in the official ChocoMaker fountain, but of course, it’s formulated to work the best there. However, any quality chocolate fountain is fine. The chocolate is also suitable for a variety of other projects including fondue or candy making. It has manageable pieces for heating. The two-pound bag is convenient. It doesn’t require any oils for correct melting. It can also be used for a variety of other projects. It’s made in a facility that also processes peanuts. There might be a slight chalky taste after the chocolate runs through the fountain for a while. Wilton’s melting chocolate is a premium style couverture with the right consistency for melting in chocolate fountains or other projects. There’s no need for extra oils, and the chocolate pieces are wafer style, so they melt smoothly and consistently. Each bag contains two pounds of chocolate, so it’s just the right size for a small dinner party (12 or so people). It heats evenly and resists scorching in the microwave as long as you stir pretty frequently. It’s best over a double boiler so you can slowly incorporate the chocolate into the liquid state, but both methods should give you a pretty good consistency. It runs smoothly, and though it’s best used with Wilton’s official fountain, any quality chocolate fountain will work fine. The chocolate is thick and sticks to your dippables pretty well without creating a lot of drip or runoff. It’s possible to find it in all three primary chocolate flavors, but the most common is the milk chocolate. It has a slightly grainy consistency from the sugar content. You may want to take some extra care when melting it down to try to avoid this texture, but there isn’t much you can do about it. It doesn’t affect the taste at all, however. The taste itself is good for bulk chocolate. It’s rated for use in candies and fondue, but we’d stick with using it for dippables because the taste is just okay on its own. You don’t need to add oil during the heating process. It comes in a wafer style, so it’s easier to melt. Two-pound bags are a good size for most dinner parties and events. Easy to store the leftover chocolate (bag reseals). Some batches have a grainy texture. The Premium line is a kosher, gluten-free, and trans-fat free chocolate. It contains about 38% cocoa butter, so it doesn’t require any oil or tempering before adding it to the fountain. We recommend using a double boiler to heat the chocolate gently, but you can also microwave it as long as you take it out to stir frequently. It’s a little more expensive, but the taste is probably the best out of the three. 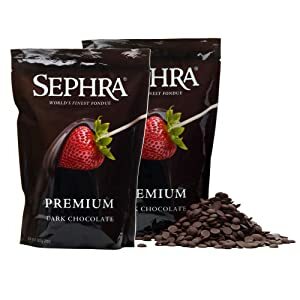 If you’re doing an event where the chocolate fountain is the centerpiece, you may want to upgrade to Sephra, so it really stands out. 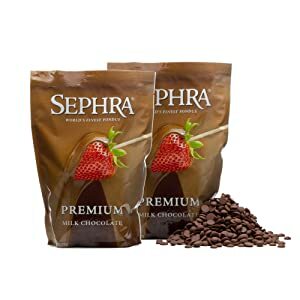 Sephra uses all natural ingredients, and there’s no palm oil. It comes in three different flavors, dark, milk, and white. The dark chocolate can keep in the fridge for between six and twelve months while the milk and white chocolates keep around three to six months. It’s very oily, so make sure you place the fountain somewhere protected where the wind won’t blow it all over your tablecloth. Also, watch out for drips on your clothing. The oils do make for a creamy consistency, and it sticks well to the dippables because of this, but it’s going to be a little tougher to clean out of the fountain and any linens or clothing. It’s very rich (up to 38% cocoa butter). The recipe uses all natural ingredients with no palm oil. It’s a little on the expensive side. The oil content makes it more difficult to clean up. Let’s talk about a few things you should know to get the best results from your melted chocolate. The short answer is “any kind,” but you’ll need to consider a few things before shoving a few Hershey’s kisses in the mix. Yes, yes, the fat content makes you shiver, but if your chocolate doesn’t have a high enough cocoa butter content, it’s never going to melt smoothly. Many chocolatiers use a variety called couverture, which has a cocoa butter content of about 36 to 39%. The chocolate liquifies well and only needs to be heated to a liquid temperature in a double boiler before inserting in the chocolate fountain. Other types of chocolate, particularly candy bar styles, have far less cocoa butter content. To make them run smoothly through the fountain and prevent gumming up the gears, you’ll need to add additional fat to keep things smooth. With some candy chocolate, the cocoa butter hovers around 32%, which may not seem like a big difference, but it is. You’ll need to add as much as a cup of neutral flavored vegetable oil for every five pounds of chocolate, or there’ll be a problem. All types of chocolate work with a chocolate fountain provided you have the right fat content. Different types of chocolate work well with various items you plan to dip. Here are a few suggestions. Dark or semi-sweet chocolate has a smaller sugar content than other types of chocolate. It might be good with things that are already on the sweeter side such as high sugar fruits (think strawberries or raspberries) and sweet, plain cookies. The slight bitter property of the chocolate brings out the sweetness of these items and gives the taster an interesting contrast. Milk chocolate is on the sweeter side, so it might be cloying when combined with other genuinely sweet things. Slightly more savory cookies and cheeses are often good with milk chocolate (although don’t completely rule out fruit. Fruit is good with just about anything. If you want a fruit option with milk chocolate, you might try tart apples such as Granny Smith or a citrus fruit like oranges to offset the sweetness. White Chocolate can also be used for a chocolate fountain. White chocolate has a deep and creamy taste. It’s frequently used with strawberries, but you might also try different cheeses for a savory and sweet mix. White chocolate is also good to use with mint style cookies or desserts. If you just aren’t sure what people will want, we recommend going with milk chocolate. 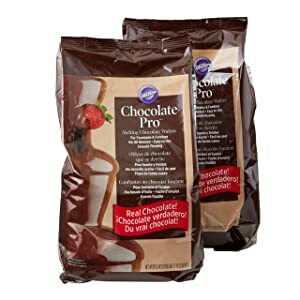 It’s universally tasty and blends well with some of the basics people look for at a chocolate fountain (simple fruits, cookies, and cake bites). If you can get couverture, it’s always worth it. The taste is one of the smoothest you’ll have at a chocolate fountain and usually just the right consistency with minimal effort. However, it can be a bit expensive if you’re planning to have enough chocolate to feed a large number of people. One of the best methods is using chocolate chips or inexpensive chocolate bar candy and adding a simple vegetable oil for consistency. If you don’t like the idea of using vegetable oil, you can use coconut oil as a slightly healthier alternative, but this will drive up your cost again. Consider the taste and consistency versus the price to decide where your line is. Chocolatiers use couverture as a covering for specially prepared chocolate treats, so you don’t need to do anything but heat the chocolate in a double boiler (or, ok the microwave, but be careful of scorching) to the right consistency before adding it to your fountain. Other types of chocolate need fat added to be consistent (as we mentioned above). Even if you melt the chocolate to a runny consistency, without the fat content, your chocolate fountain will struggle to keep the chocolate flowing. A general rule is a cup of your oil per every five pounds of chocolate. Don’t ever try to melt your chocolate directly in the fountain. The heating mechanism isn’t equipped to take chocolate from a solid to liquid state, and one of two things will happen. Your party will be over by the time it gets a little mushy, or you’ll damage your chocolate fountain completely. Trust us. Take the ten minutes and slowly heat your chocolate over a double boiler (ideal) or in the microwave while frequently stirring to protect against scorch. All the dippable bits can be stored in the refrigerator just as you would any other leftovers. Leftover chocolate can also be stored in the refrigerator. We prefer glass so that no weird smells or strange tastes can bleed into the chocolate, but high-quality plastic containers are fine. Once the chocolate resolidifies, you may notice a bit of discoloration on the top. This is totally normal. The cocoa butter or other added fat tends to rise to the top as the chocolate hardens creating the marbled or streaked look. It will reincorporate with no issues once you reheat the chocolate again. Melting chocolate in the microwave is convenient, but chocolate scorches pretty quickly. It’s much better to go slowly and stir frequently to prevent hot pockets from developing and ruining the taste of the chocolate. Cleaning up chocolate oils is a little more comfortable if you pre-treat the oil stains with a dish soap meant to break up the fats. You can often get out a stain using this method before washing, and you won’t be stuck with an oil splotch on an otherwise clean shirt. Chocolate fountains are delightful, and we don’t care if some event experts call them cliche. There’s nothing more exciting than a cascading wall of chocolate, and we can’t wait to get our hands on some cake bites or strawberries! As long as you go slowly and know what you’re getting into, a chocolate fountain can be a party tradition everyone will love. What’s your favorite kind of chocolate? We’re dark chocolate fans ourselves. Let us know your preference in the comments below. Some posts may contain affiliate links. CookingTimeJournal.com is a participant in the Amazon Services LLC Associates Program, an affiliate advertising program designed to provide a means for sites to earn advertising fees by advertising and linking to Amazon(.com, .co.uk, .ca etc).